Jaipur is the capital city of Rajasthan state. It is the largest city of Rajasthan and also famous as the “Pink City of India”. It was formed on 18th November 1727 by Jai Singh (II). According to the census 2011, the average literacy rate of Jaipur is 75.51%. From few years, Jaipur is also being famous to pursue the education in different fields. Students from different parts of the country are choosing this city to pursue their higher education. 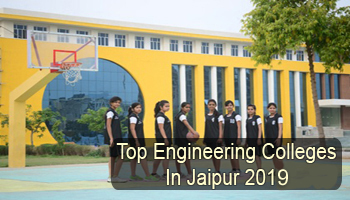 Through this article, students can check details for Top Engineering Colleges in Jaipur 2019. Sarvgyan.com is presenting a list of top engineering colleges in Jaipur for the year 2019. Students looking for admission into engineering courses can refer this list. Here we have included the top engineering colleges like NIT – Jaipur & many other public as well as private colleges of Jaipur. This list has been rated on several important factors. These colleges have been rated on the quality of education, placement statistics, faculty ratio, college affiliation & approval, infrastructure & facilities provided by colleges, academic excellence, etc. For admission in B.Tech & B.Arch programme, candidates can appear for the JEE Main exam. It is a national level examination organized by the NTA. Students can also take admission through REAP (Rajasthan Engineering Admission Process). It is a state level admission process which offers admission in B.Tech through the merit of JEE Main or qualifying exam (12th class). Admission in the M.Tech programme will be done through GATE scores. Engineering courses are offered in various specializations. Students can choose as per their choices. Some engineering specializations are Civil Engineering, Computer Science & Engineering, Electronics & Communication Engineering, Electrical Engineering, Mechanical Engineering & Aeronautical Engineering. If you have any other queries about Top Engineering Colleges in Jaipur 2019, you can leave your queries below.